Scott Reedy is a gritty forward with natural playmaking ability. Capable of playing at both center and on the wing, it’s easy sometimes to forget just how skilled Reedy is as he uses his solid 6-foot-2, 204-pound frame to gain position on the ice and make sure opposing players feel his presence. Playing on the wing last season, Reedy showed some good stick-handling ability that complements his willingness to play in front of the net and finish plays through opposing defenders. One of the best traits that Reedy possesses is his maturity. Playing each game with wisdom beyond his years, Reedy has the potential to quickly climb a team’s depth chart. An underrated skater, Reedy has the ability to move well and play a smart style of hockey that sets him apart from his peers, though his first stride isn’t as good as it could be. While he isn’t an overwhelming offensive threat yet, the raw talent that he possesses coupled with his size and willingness to get better bode well for his development and a potential career in the NHL. With 10 goal and 14 points in 21 games in the 2016-17 season, Reedy displayed goal scoring ability to prove that he is more than simply a gritty, playmaking forward. 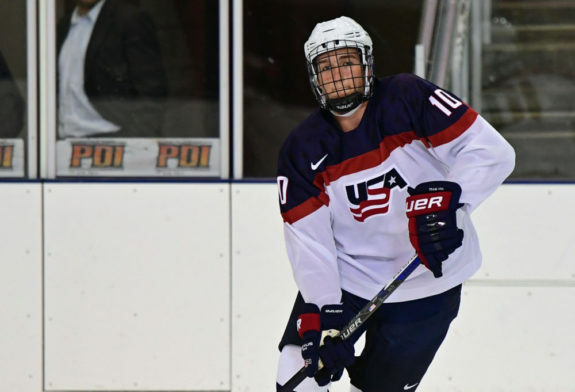 Committed to the University of Minnesota, Reedy has the chance to follow in the footsteps of so many NCAA-commits before him who quickly made the jump to the NHL after standout performances in college. Projecting by various draft rankings to go somewhere in the early second round to third round, Reedy could find himself off the board around the 40th-55th pick in the draft. A physically tough player to compete against, it wouldn’t be surprising to see Reedy turn into a solid top-six contributor sometime down the road. He’s got the size and natural ability and has proven to be a versatile forward positionally with the ability to play both center and as a flank. If his development continues to go well at the University of Minnesota, Reedy could find himself on an NHL club sooner than later as a good second-line player with first line capability due to the potential he has to quickly make the jump to the pros.